How the the designing and building of a living willow play area can be applied to attaining the six key skills embedded in the National Curriculum. Green Mansions: Living Willow Structures Enhance Children’s Play Environments. An article by Sharon Gamson Danks of EcoSchool Design in the US. Detailed instructions on how to make a living willow arch. 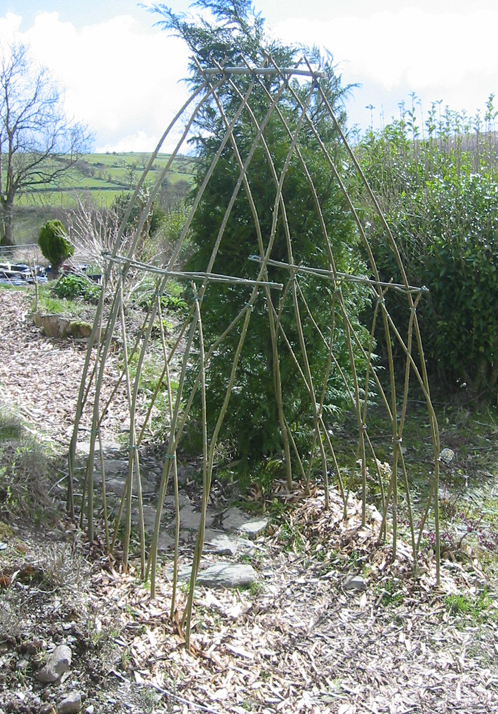 The same principles and weave can be used for any shape by adapting the floor plan accordingly: domes, fedge (living willow fedge), arbour, teepee. Instructions for maintaining your living willow structure, including whether to weave in or prune; what to do with dead rods; replacing ties; mulching; wildlife; overhanging vegetation and watering. Guidelines for planting willow rods or cuttings. Please contact us to talk about the cost of your own living willow structures or sculptures. I’m happy to arrange a free visit to discuss your plans and the amazing range of possibilities! We can also supply living willow rods and cuttings; and dried (brown) willow.